The expected duration of life after any given age, estimated according to fixed tables of mortality based on the mean number of years which individuals, under various conditions, have been found to live. The earliest important contribution to the subject is the work (1855) of De Neufville on the mortality of Frankfort-on-the-Main during the three years 1846-1848, derived from a total mortality of 3,213 amongChristians and 263 among Jews. A more recent investigation was published as part of the census of 1890, entitled "Vital Statistics of the Jews in the United States," being the partial results of a special inquiry, made under the direction of Dr. John S. Billings, formerly assistant surgeon-general of the United States and an authority on hygiene, of about 10,000 Jewish families in the United States. Both investigations fall short of the necessary degree of scientific accuracy with which such tables of mortality and life-expectancy are prepared for life-insurance purposes. Their value is impaired by the fact that the method adopted for the calculation of the tables was not stated. 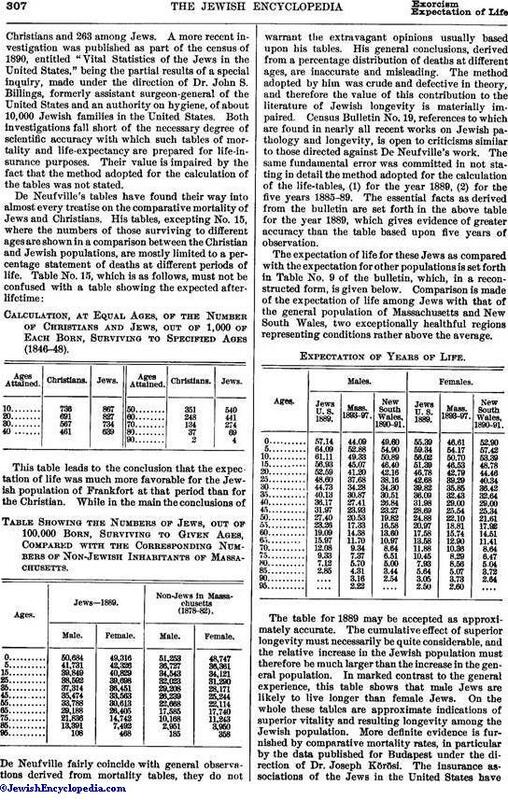 Calculation at Equal Ages, of the Number of Christians and Jews, out of 1,000 of Each Born, Surviving to Specified Ages (1846-48). Table Showing the Numbers of Jews, out of 100,000 Born, Surviving to Given Ages, Compared with the Corresponding Numbers of Non-Jewish Inhabitants of Massachusetts. This table leads to the conclusion that the expectation of life was much more favorable for the Jewish population of Frankfort at that period than for the Christian. While in the main the conclusions of De Neufville fairly coincide with general observations derived from mortality tables, they do not warrant the extravagant opinions usually based upon his tables. His general conclusions, derived from a percentage distribution of deaths at different ages, are inaccurate and misleading. The method adopted by him was crude and defective in theory, and therefore the value of this contribution to the literature of Jewish longevity is materially impaired. Census Bulletin No. 19, references to which are found in nearly all recent works on Jewish pathology and longevity, is open to criticisms similar to those directed against De Neufville's work. The same fundamental error was committed in not stating in detail the method adopted for the calculation of the life-tables, (1) for the year 1889, (2) for the five years 1885-89. 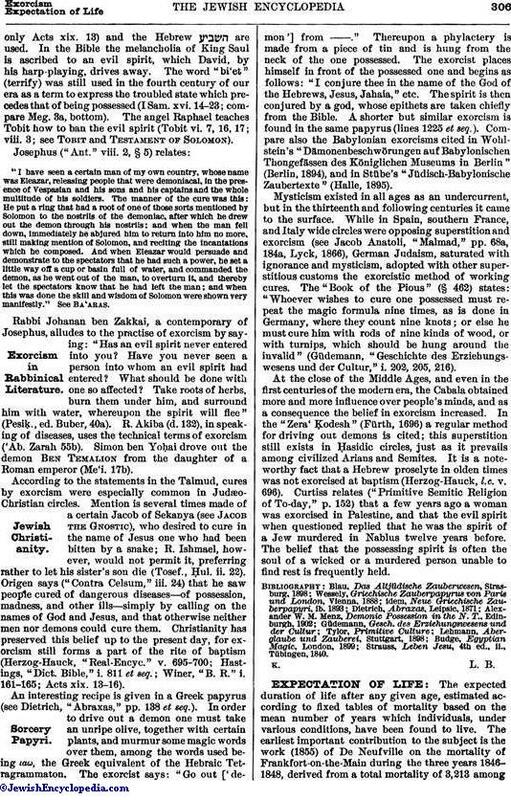 The essential facts as derived from the bulletin are set forth in the above table for the year 1889, which gives evidence of greater accuracy than the table based upon five years of observation. The expectation of life for these Jews as compared with the expectation for other populations is set forth in Table No. 9 of the bulletin, which, in a reconstructed form, is given below. Comparison is made of the expectation of life among Jews with that of the general population of Massachusetts and New South Wales, two exceptionally healthful regions representing conditions rather above the average. Expectation of Years of Life. The table for 1889 may be accepted as approximately accurate. The cumulative effect of superior longevity must necessarily be quite considerable, and the relative increase in the Jewish population must therefore be much larger than the increase in the general population. In marked contrast to the general experience, this table shows that male Jews are likely to live longer than female Jews. On the whole these tables are approximate indications of superior vitality and resulting longevity among the Jewish population. More definite evidence is furnished by comparative mortality rates, in particular by the data published for Budapest under the direction of Dr. Joseph Körösi. 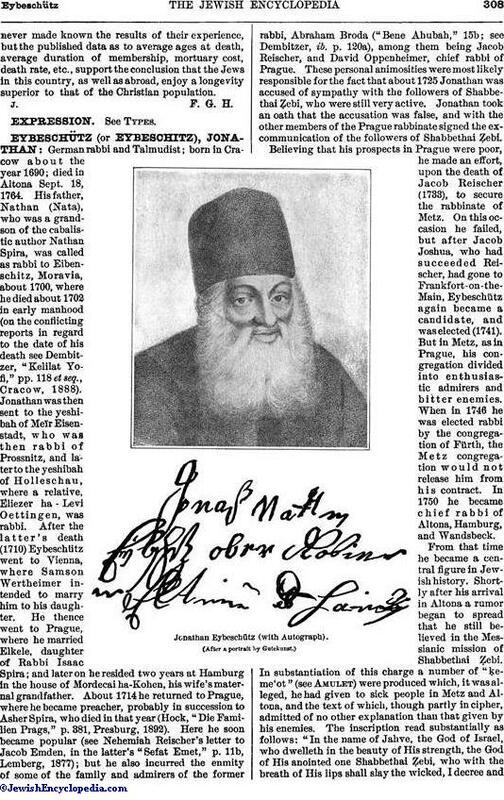 The insurance associations of the Jews in the United States havenever made known the results of their experience, but the published data as to average ages at death, average duration of membership, mortuary cost, death rate, etc., support the conclusion that the Jews in this country, as well as abroad, enjoy a longevity superior to that of the Christian population.